Hank's primary antagonist on the ranch. Pete is Sally May's favorite pet and he frequently uses this to his advantage in his petty clashes with Hank. Pete is much more clever than Hank and usually manages to outwit him, although Hank usually perceives the events differently. Many of Hank's adventures are initiated by an embarrassing incident where he has been tricked by Pete. In "The Further Adventures of Hank the Cowdog", Hank's eyes go crossed after staring at a bloody nose he received by attacking a fried egg Pete obtained that was just behind Sally May's garden fence. In "The Curse of the Incredible Priceless Corncob", the entire story revolves around Hank's over-protectiveness towards a corncob Pete has tricked him into believing is worth a fortune. 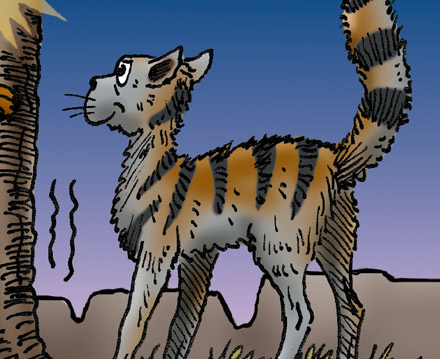 In "The Case of the Missing Cat" Hank eventually loses patience with Pete and tries to strand him on the plains, but has a change of heart and rescues him from the coyotes Rip and Snort. The two then lament the fact that by saving Pete's life Hank and Pete must be friends and stop fighting each other. At the end of the adventure, however, the two return to fighting over scraps, suggesting that they both secretly like their antagonistic relationship.